Download my Master thesis: Social and artistic aspects of everyday sound -A deep listening into the world of sound & noise. Link to C:ART:MEDIA and my graduate exhibition at 300m3 Art Space, Göteborg, May 2008. The red speakers sounds of global voices recorded during my masterproject in which I had asked people imitate the sounds they like and dislike. 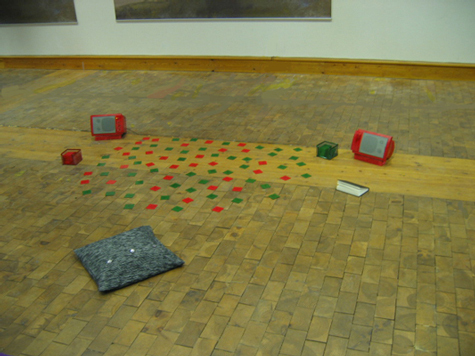 The red and green forms on the floor and in the boxes are labeled with all the soundsources mentioned. In another installation nearby, I presented a three-track soundmix in earphones. This sound piece is based upon my interviews of and sound imitations made by 38 people from all over the world. A track playing a specific sound will be heard in the left earphone. At the same time, one persons associations, memories and stories about this sound will be heard in the middle of the head while the voice imitation of the same sound plays in the right ear.